Overpricing is a destructive way to introduce your home to the market. We are not in a market where prices are increasing. In fact, in reviewing the current sales of homes, prices have finally stabilized but not increasing. Overpriced properties tend to take an unusually long time to sell (if they sell at all), and they typically end up being sold at a lower price than they likely would have had they been priced properly in the first place. Accurate initial pricing and reductions as necessary are crucial. 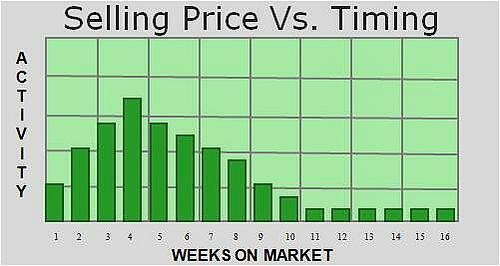 Timing of price reductions is also very crucial! Not reducing your price at the right time creates a situation known as “chasing the market”, which is when you reduce to the wrong list price at the wrong time. Limits buyers. Potential buyers may simply refuse to view your property because it appears to be priced to high. Limits showings. Qualified buyers are held in high regard in the current market. Other Agents will be reluctant to waste the time of a qualified buyer, and, instead, will take their Buyers to view the properties that are priced correctly. When many homes and condos are available that are priced correctly, they have no motivation to view your overpriced property. We’re no longer in a Seller’s Market where there’s a shortage of available homes. Before a Buyer’s Agent submits an Offer on your home, they will research recent Sales of Comparable Homes in your area and will not be willing to offer more than a fair market price, so if you’re overpriced, this means you’re more likely not to get any Offers at all since many correctly priced Properties are available. Extended stay on the market. When a home is on the market too long, it is perceived as defective. Buyers wonder, “what’s wrong” with that property that I should know about. Last but probably most importantly, an Appraisal is required to finance a home. Did you know that when you’ve accepted a Contract on the Pending Sale of your home, the Buyer’s Lender will require an Appraisal? Along with other items, the Appraiser uses recent sales of comparable homes in your area in order to determine its Appraisal value. If your home is overpriced, it will Appraise at less than your listed price and the deal will simply fall apart.